London - Jamaican track superstar Usain Bolt can play a key role in inspiring youngsters to get involved in athletics even though he has hung up his running spikes, IAAF president Sebastian Coe said on Wednesday. 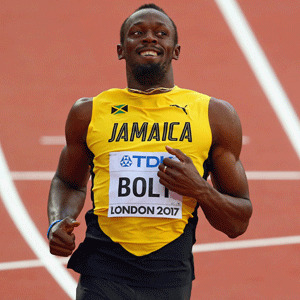 Bolt, the world record holder in the 100m and 200m, brought down the curtain on his glittering career at the London world championships in August. Coe, himself a two-time Olympic gold medallist, said he was due to meet the 31-year-old Jamaican before Christmas to discuss what he could do. "I had conversations with the Jamaican prime minister when I went to watch Bolt run his final race there," Coe told reporters at the Sport Business Summit, held at Chelsea's Stamford Bridge ground in London. "Jamaica's challenges aren't dissimilar to ours in figuring out all the inspirational things he can do in Jamaica and for us on a global scale," he said. "At the moment it is difficult for me to say what he can do beyond engagement with young people. I don't think I have ever witnessed anyone in any sport apart from Muhammad Ali who has had that ability to engage with the young." International Association of Athletics Federations chief Coe said it was difficult to see the enormous vacuum left by Bolt on and off the track being filled immediately. "Nobody will fill the boots straight away," he said. "This is not just simply about someone who will dominate sprinting for the next three Olympic Games. "It is maybe not being philosophically or politically correct but we are in the entertainment business. "The athletes have to have an opinion, they must be able to dominate a room and a stadium and sometimes I sit there at athletes' press conferences and I wonder are you really offering as much as you should? "I want to feel like I wasn't expecting that response, they have to be interesting, take the sport beyond the stadium, they have to reach out." Coe backed the right of American sports stars to "take a knee" in protest during the playing of the US national anthem following a tirade against them from President Donald Trump. "I believe in personal freedoms, always," said Coe. "You have to be. Sport is rarely a mirror image of society. Sport sets the trends. "For instance Jesse Owens in the 1936 Olympics in Berlin (who exploded the myth of Aryan superiority) or the raised fist salute in the 1968 Games (involving 200m medallists Tommie Smith and John Carlos). "Sport will always take a view, sometimes makes one uncomfortable but we all have an individual view. "I have never felt under pressure from political leaders, not even 1979/80," added Coe with a trace of a smile, referring to pressure put on him and his father by a minister in Margaret Thatcher's government to boycott the 1980 Olympics in Moscow over the then Soviet Union invasion of Afghanistan -- he declined and went on to win his first gold.